India won the final two ODIs against Australia and have won the opening two ODIs vs hosts New Zealand. A win on Monday at the Bay Oval in Mount Maunganui will help India seal the series by taking an unassailable 3-0 lead. 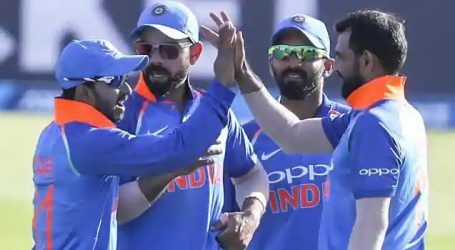 The Indian cricket team is on a four-match winning streak in One-Day Internationals (ODI) and will look continue its good form against an under-performing New Zealand in the third game of the five-match ODI series today. The Kiwis will be raring to make an impression against the No.2-ranked ODI team in the world and keep the series alive. New Zealand wins the toss and elects to bat first in the 3rd ODI. Colin Munro (7) thrown his wicket while attempting to drive the delivery from Mohammed Shami, gets a thick edge which ends straight into the hands of Rohit Sharma at first slip. Bhuvneshwar Kumar took Martin Guptill’s wicket. Dinesh Karthik took the catch. New Zealand are 26/2 in 6.1 overs. Kane Williamson departs for 28. Yuzvendra Chahal gets the breakthrough. New Zealand 59/3 in 16.2 overs. Ross Taylor scored 46th ODI half-century, it was great from veteran, brings it up with another boundary. Ross took his time from the beginning, made the most of the poor deliveries and helped his side add important runs.